1. We choose the right outlet. GCFI outlets protect people where there will be water present near an outlet. Once installed, they need to be accessible to be able to be reset (so we don’t install them on ceilings or where they cannot be reached). These outlets help to prevent fires in areas where cords are likely to be pinched, crimped or damaged by pets. AFCI outlets are now required in all standard living areas in new builds, renovations, and upgraded electrical systems. 2. We remember neutral wiring. All switch locations require a neutral wire. That’s why we always make sure to install neutral wiring when handling an electrical project. 3. We don’t resist tamper-resistant receptacles. Tamper-resistant receptacles not only help keep kids safe, but they are also required by the National Code. To make sure that your home is within code and is keeping those who enter safe, we use tamper-resistant receptacles. 4. We choose the right outdoor outlets. When used outside, the old “flat”-style receptacles don’t protect the cord connection point when it rains or snows. The newer “bubble”-style covers provide non-stop protection. That’s why they are required to make code and why we use them in outdoor electrical projects. 5. We remember that there’s strength in numbers. Any receptacle must be within reach of a 6-ft. appliance cord. Extension cords can cause fires in homes. Thus, it’s best to avoid extension cords by installing ample outlets. That’s why we make sure that we install an adequate number of receptacles for your home. It keeps you safer and avoids a code violation. Code violations are a hassle! That’s why we strategically perform all electrical work to avoid code violations and keep you and your family safe. Do you need electrical work on a home improvement project? 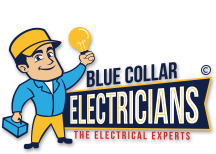 Call the electricians who can handle it all – Blue Collar Electricians.